There’s a lot that’s new with the Climate Web! First, please visit and subscribe to our brand new Climate Web YouTube Channel. It’s already a great resource for getting introduced to the Climate Web and for exploring it in depth — and it will get much better. 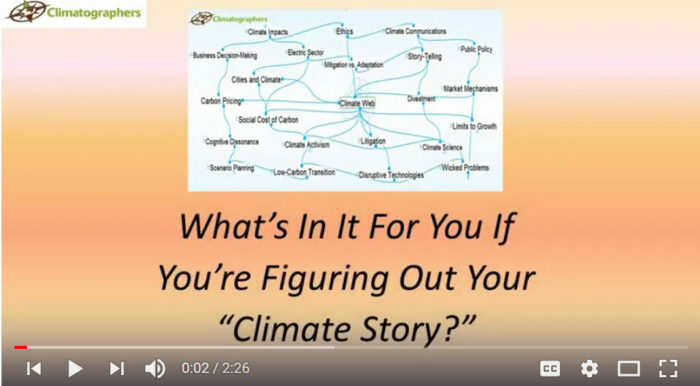 Since the Climate Web points you to more than 100 climate-relevant YouTube channels, and more than 1,500 YouTube videos, it may help serve as a climate gateway into YouTube. If you’ve followed my work over the years on topics like Climate Chess and the 1,000,000 piece Climate Change Jigsaw puzzle, you’ll know I’m not overwhelmed by the way in which climate advocates organize and coordinate their efforts in order to tackle climate change. But we rarely see the kind of circular firing squad that Chris Mooney reported on this week in the Washington Post. Stanford’s Mark Jacobson has actually filed a libel suit against the authors of a peer-reviewed article that challenges some of the assumptions in Jacobson’s work in which he suggests that we can “immediately” transition to a 100% renewable energy mix. There’s plenty of room for technical debate on this topic; in fact, you can dig deep into all of the associated issues through the I:100%RenewablesCase Index Entry in the Climate Web. But for one climate advocate to sue other climate advocates over disagreements regarding modeling assumptions? Really? One of the things we obviously need more of when it comes to tackling climate change is dialogue of all kinds. And there is an I:ClimateDialogues Index Entry in the Climate Web. But we recently came across some great work in this area by Kimberly Nicholas of the Lund University Centre for Sustainability Studies. Check out her “We Can Fix It World Café” page. Last item for today — I’ve always been intrigued by the Bulletin of Atomic Scientists’ Doomsday Clock. We’ve just added this Doomsday Clock Animation video to the Climate Web. Check it out — it’s worth the two-minute view! I hope you find this week’s additions to the Climate Web as interesting (and frustrating) as I do. Again, please visit the Climate Web’s new YouTube channel! Suggestions welcome!